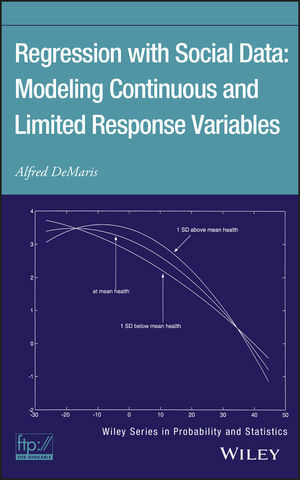 Regression with Social Data: Modeling Continuous and Limited Response Variables represents the most complete and fully integrated coverage of regression modeling currently available for graduate-level behavioral science students and practitioners. Covering techniques that span the full spectrum of levels of measurement for both continuous and limited response variables, and using examples taken from such disciplines as sociology, psychology, political science, and public health, the author succeeds in demystifying an academically rigorous subject and making it accessible to a wider audience. Concepts are reinforced throughout with numerous chapter problems, exercises, and real data sets. Step-by-step solutions plus an appendix of mathematical tutorials make even complex problems accessible to readers with only moderate math skills. The book’s logical flow, wide applicability, and uniquely comprehensive coverage make it both an ideal text for a variety of graduate course settings and a useful reference for practicing researchers in the field. ALFRED DeMARIS, PhD, is Professor of Sociology at Bowling Green State University, Ohio. In addition to consulting on a regular basis, Dr. DeMaris has published well over fifty research papers and is a member of several local university and community boards. 1. Introduction to Regression Modeling. 3. Introduction to Multiple Regression. 4. Multiple Regression with Categorical Predictors: ANOVA and ANCOVA Models. 6. Advanced Issues in Multiple Regression. 7. Regression with a Binary Response. 8. Advanced Topics in Logistic Regression. 9. Truncated and Censored Regression Models. 10. Regression Models for an Event Count. 11. Introduction to Survival Analysis. 12. Multistate, Multiepisode, and Interval-Censored Models in Survival Analysis. Appendix B: Answers to Selected Exercises.